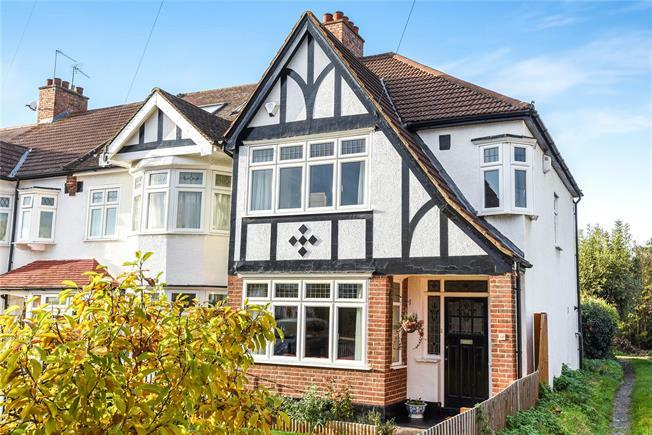 3 Bedroom End of Terrace House For Sale in West Wickham for Asking Price £530,000. Well presented three bedroom end of terrace family home situated on the ever popular Langley Way. The ground floor briefly comprises; entrance hall with stripped wooden floorboards, front reception room with feature fireplace, second reception room with doors to garden and a modern fitted kitchen. The first floor has a family bathroom and three bedrooms, two with fitted wardrobes. Externally the neatly presented rear garden is mainly laid to lawn with a patio, shed and garage. To the front, the garden offers potential for off-street parking (subject to planning).This property is located close by West Wickham High Street, station, good schools including Pickhurst Infants and Juniors and Langley Park Secondary Schools for boys and girls and is accessible to Bromley, Beckenham and Hayes. Viewing recommended.